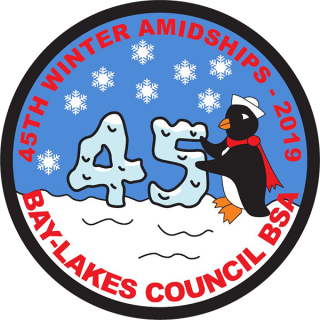 Bay-Lakes Council, Boy Scouts of America and the alumni of the Fond du Lac Scouts are proud to invite you to the 45th Winter Amidships (WAM)! This all Scouting event. WAM is a 1-day event for Boy Scout Troops, Venture Crews, Sea Scout Ships, Career Explorer Posts, Varsity Teams, Girl Scout/Mariner Troops and American Heritage Girls Units. Youth participants must be registered members of the Boy Scouts of America (Troop, Crew, Ship, Team, Post participant), or Girl Scouts-USA, or American Heritage Girls. Events include: Compass Relay, Knots, Life-Jacket Relay, First-Aid, International Code Flags, Obstacle Course, Scooter Relay, Heaving Line, Bowing, Tug-of-War and Happy Feet Relay. The cost includes all events, dinner, an awards presentation, dance and event patch. Pre-registration is required.